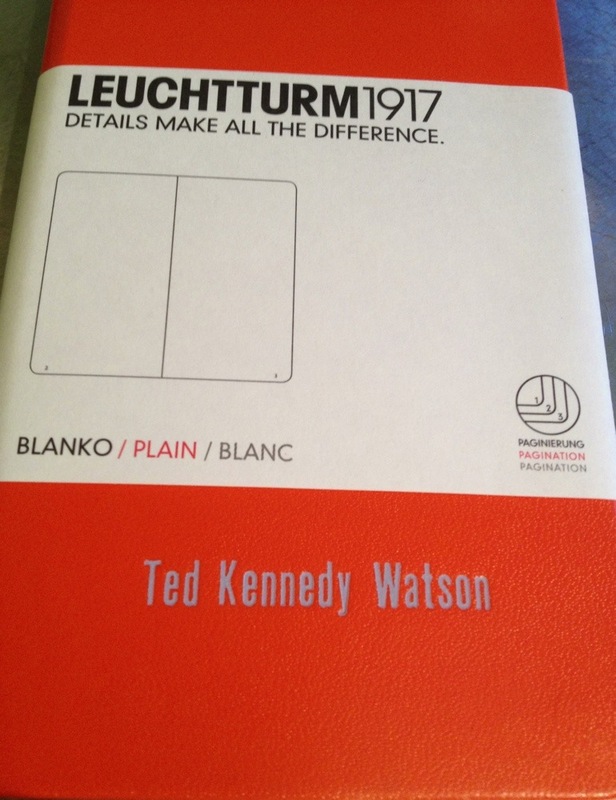 If you are in the New York City area this glorious Sunday late afternoon/early eve please stop by Dempsey & Carroll at 1049 Lexington Avenue where I will be signing books and also showing my first boxed set of cards for The Ted Kennedy Watson Paper Collection. 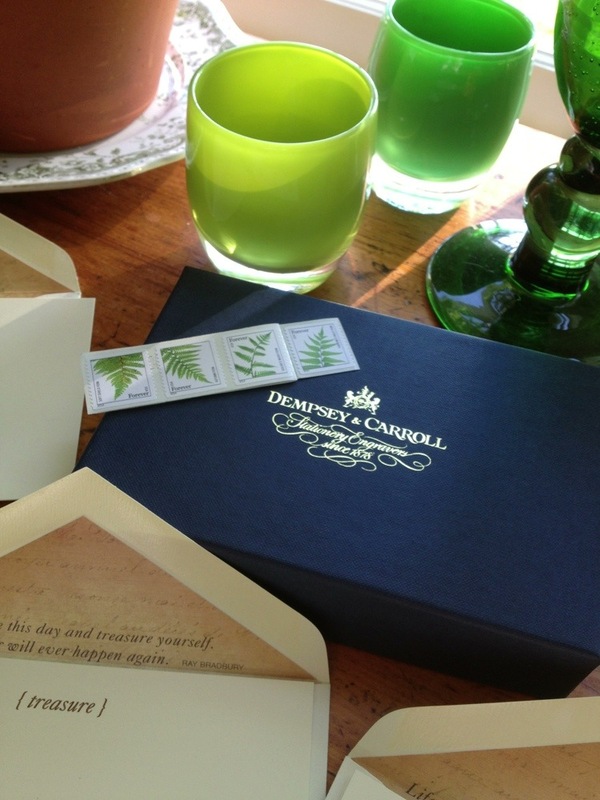 The new stationery set I designed for Dempsey & Carroll arrived on Monday, perfectly timed for the release of the book. 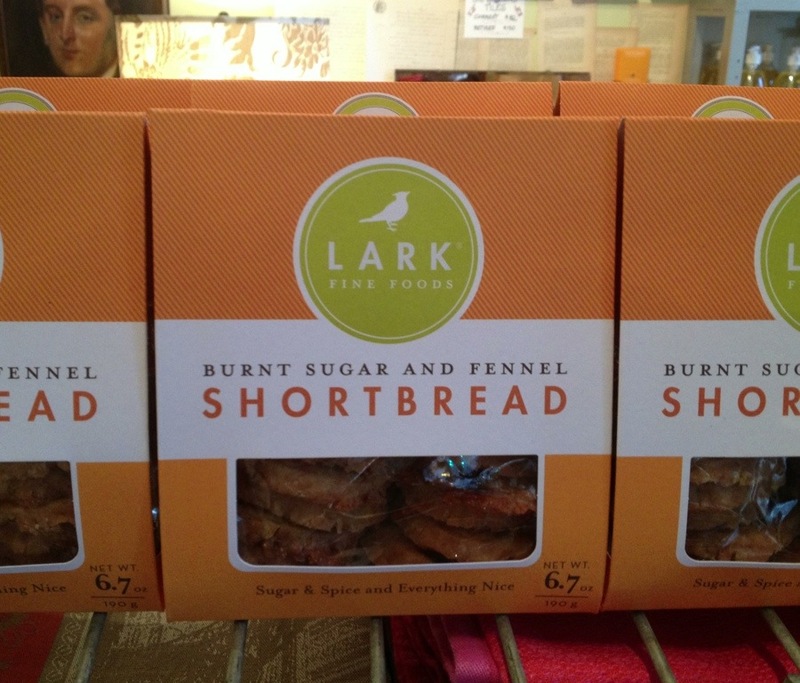 They make a swell duo, I might add. I feel so honored to have had the chance to work with legendary Dempsey & Carroll who is one of the oldest stationers in the country. 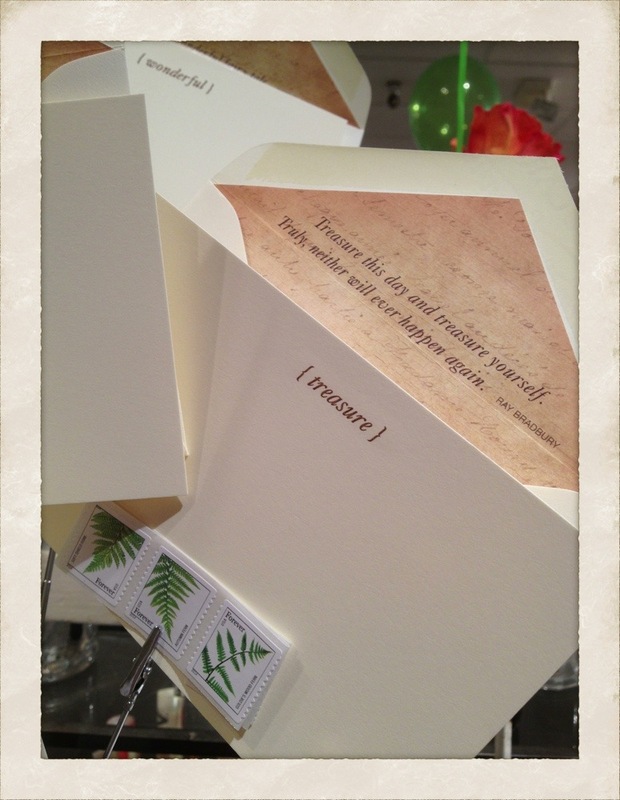 The boxed set of 10 cards, 2 of each design also comes with fern ‘forever’ stamps included. My idea was the box could sit out on your desk or in a drawer and be at the ready for whenever you needed to jot a ‘thank you’ note to a friend or just send a note, just because. You have 5 different words to choose from. 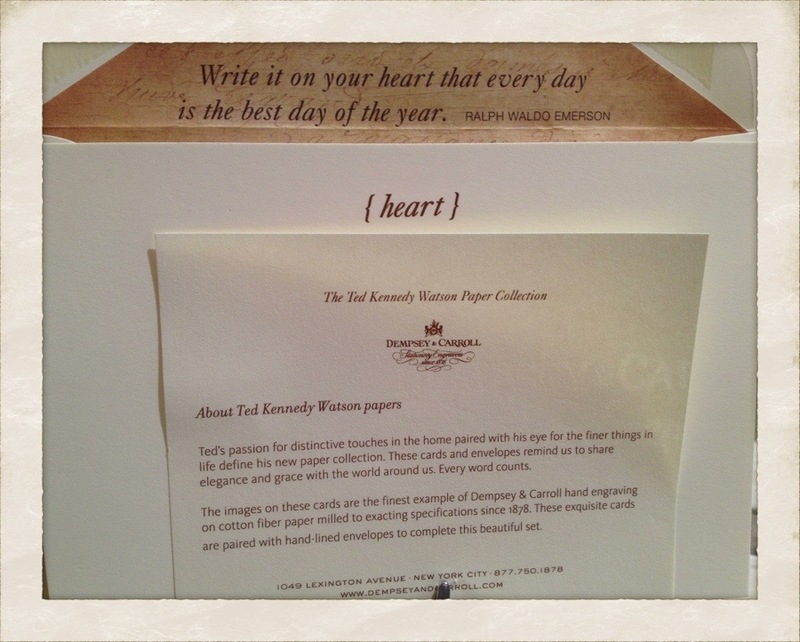 The words were pulled from quotes that are on the lining of the envelope. Most of the quotes were pulled from my book. 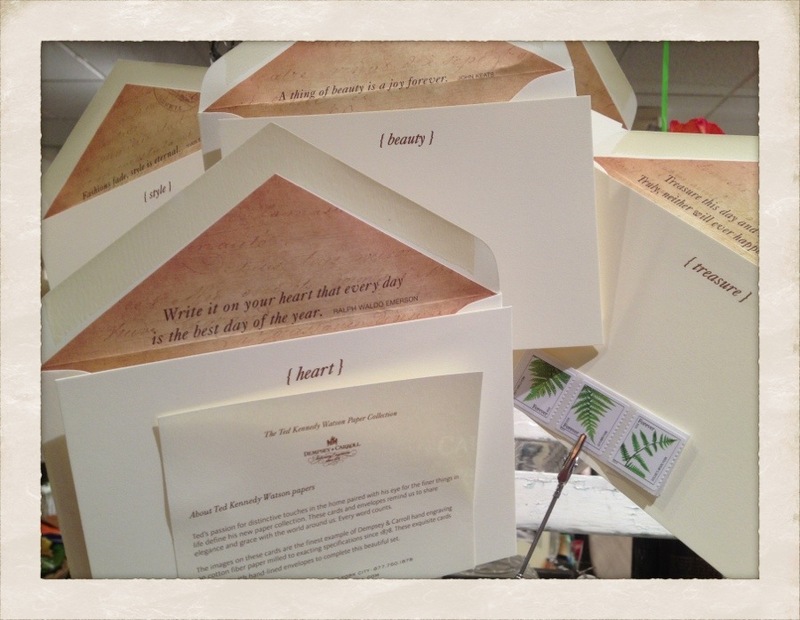 The brown ink and handsome envelopes work nicely for both men and women. 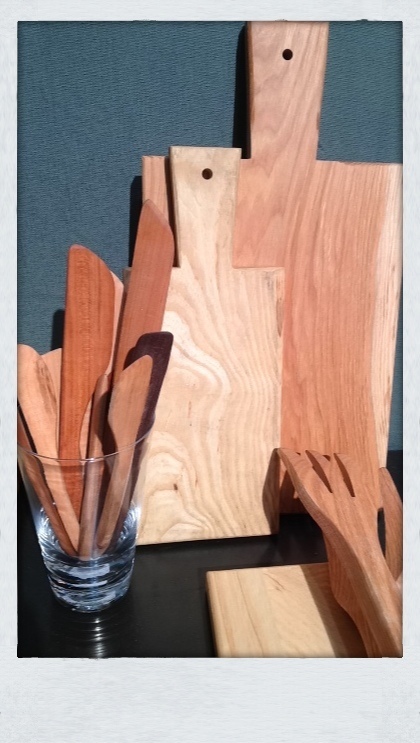 The sets are available at Dempsey & Carroll, Watson Kennedy and at other fine shops who carry the Dempsey & Carroll line. The Barnes & Noble book signing last night was just lovely and fun. 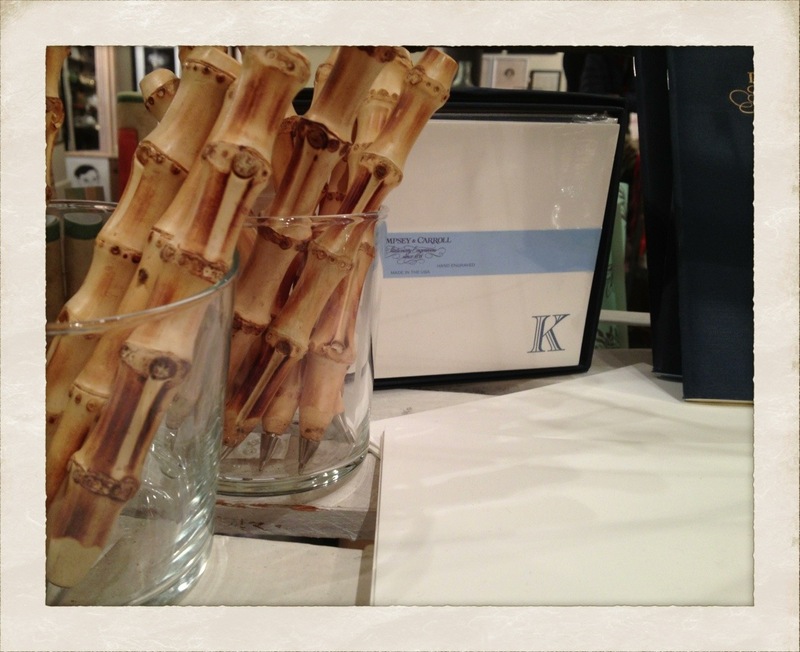 They had a bunch of displays set around the store for Style & Simplicity which made me so happy. I also signed all the 100+ copies they have in stock so if you are around the Pacific Place area in downtown Seattle and need a book or a quick gift, they have you covered. 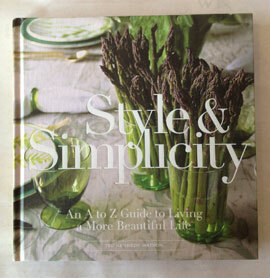 I will be at the wonderful Metropolitan Market in West Seattle today from 4 to 6 signing books. I know they are planning on serving some yummy things taken from recipes from the book. Stop by! Would love to see you if you are in the area. Happy Friday all. I had a working meeting in the city on Wednesday before I headed back up to Hawthorne. 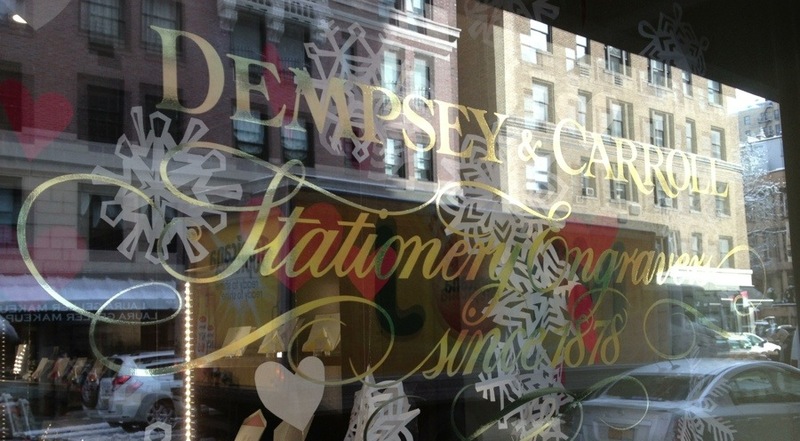 I am working on a collaboration with the legendary stationer Dempsey & Carroll. To debut when ‘Style & Simplicity’ comes out on May 6th. The idea is that it will be a boxed set to compliment the book. My idea is that it will make a great gift when combined with the book too. Handwritten notes hold such a special place in my heart, so I am so honored to have this opportunity with the likes of a Dempsey & Carroll, which I have so long admired. More on all this when the date draws closer. I was left with about an hour after my meeting before I needed to be to Penn Station for the 1:20 train to Hudson. 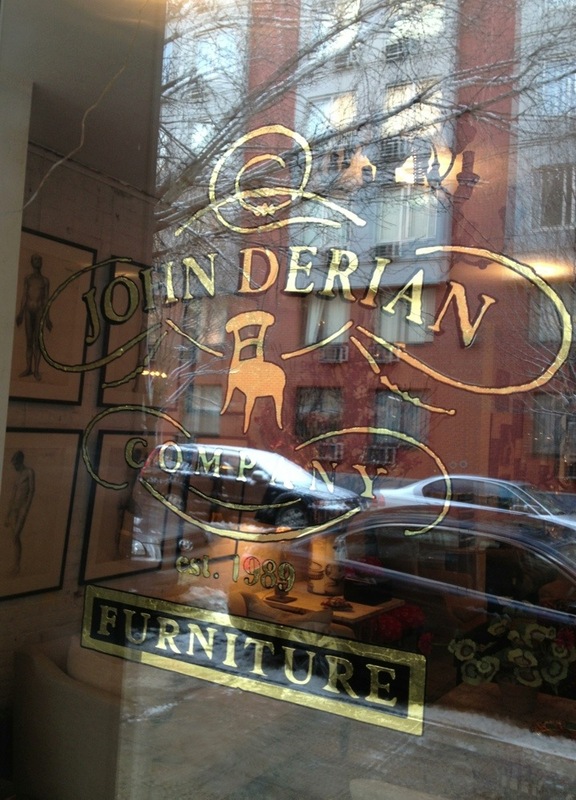 There is no place in New York City that I would choose to wonder around for an hour more than at John Derian’s shops. I have been coming to his original shop for close to 20 years. 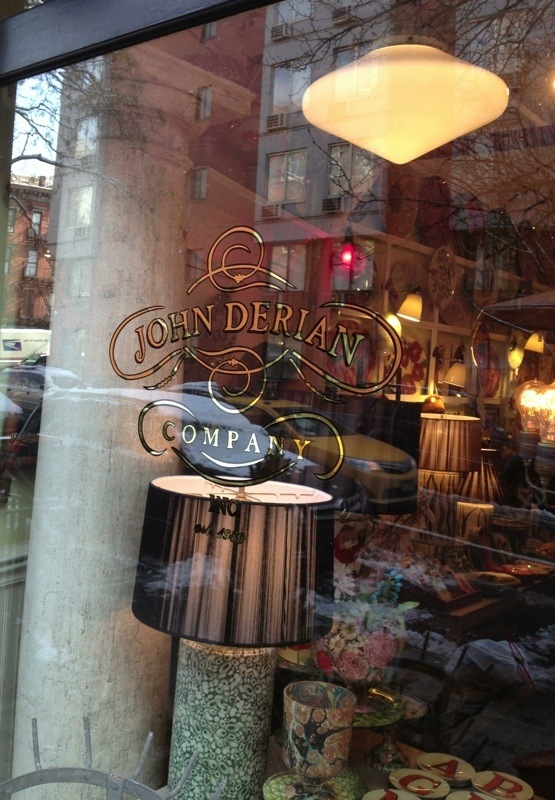 I wrote in my book the importance of shopping at independent retailers–how they give a city flavor & personality. The love and care and attention to detail they give to their shops is inspirational on many levels. 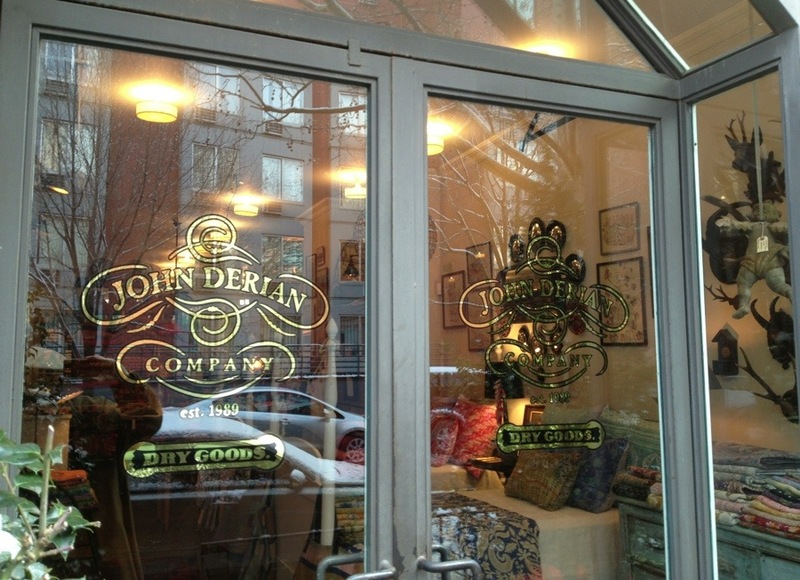 John later added another shop a few doors down from the original. This one filled with linens, artwork, bedding, and all the special one of a kind vintage goods spotted with his keen eye. And most recently, he added another space to the grouping, smack dab right in between the other two, featuring his fab furniture line. It is just a magical delight to wander between the three spaces. If you have an extra hour on your hands in the city, this is where to spend it. Orange seems to be a color I come back to time and again. The energetic hue is something my eye is drawn to when I am snapping photos or just want a visual boost. I thought I would share some of my favorite orange shots. 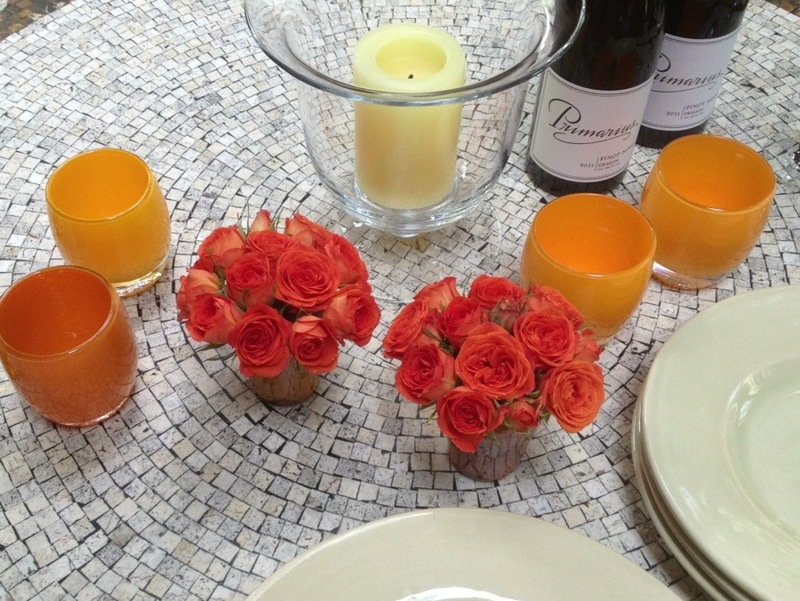 The above orange roses at the Kips Bay house I toured in New York last month were just so pretty. 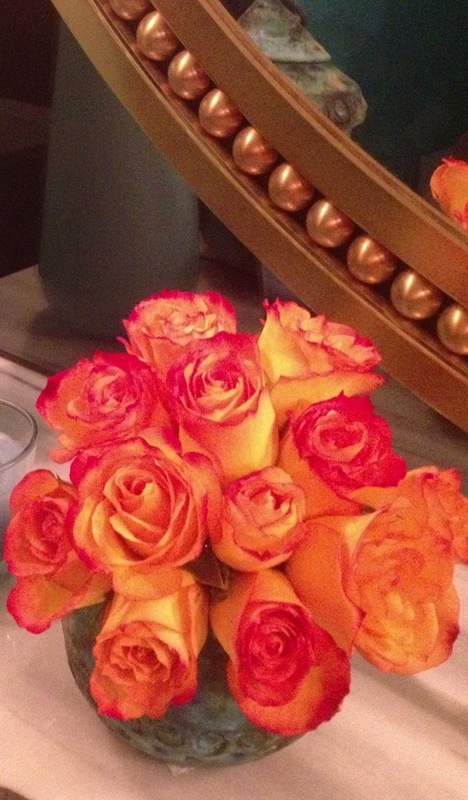 These little orange roses were the only thing I could find at the country grocery store in Putnam County, but they ended up working quite swell cut super short and tightly grouped together. 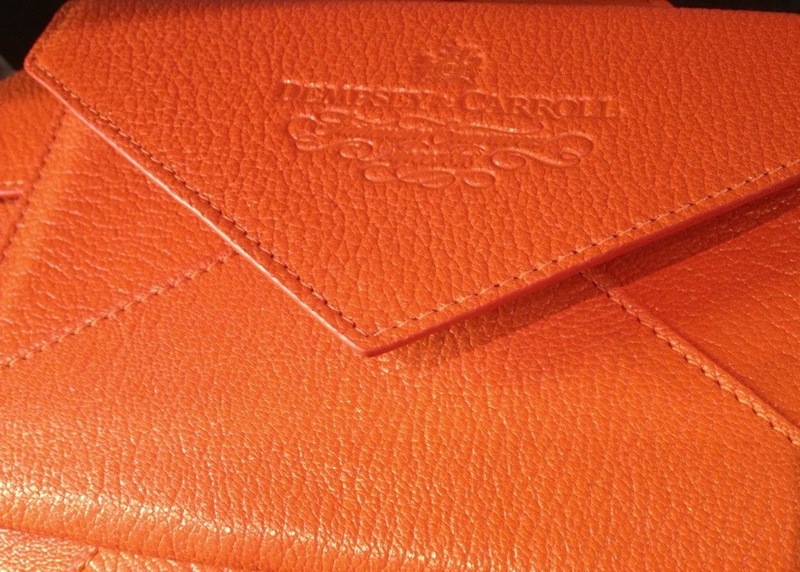 A lovely new Dempsey & Carroll orange leather wallet to hold their cards that I picked up when I was at their shop. I think it will look so fun left out on the desk. 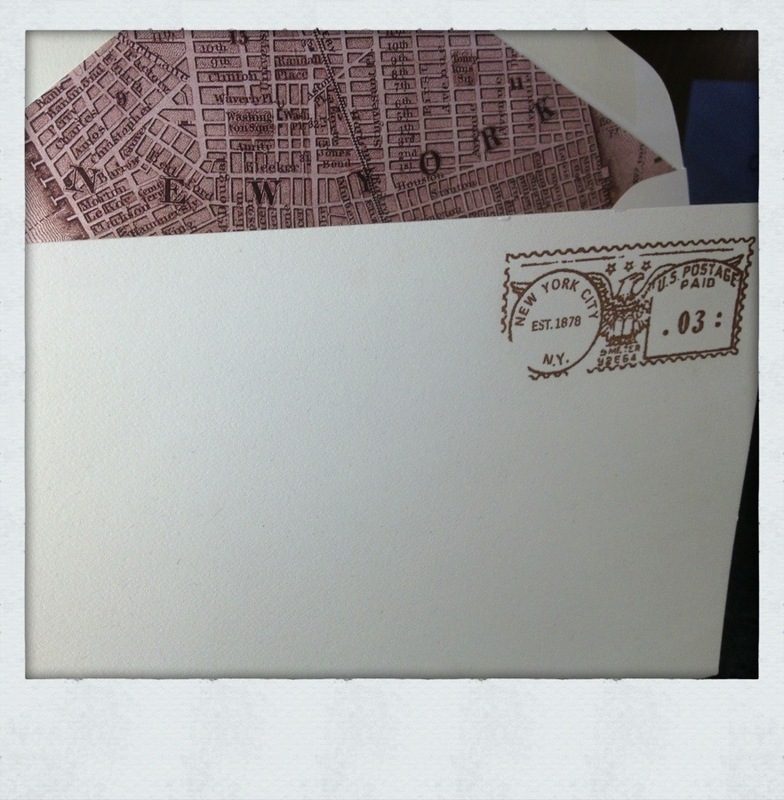 The below journal sent to me as an invitation to see the vendor at the stationery show. What a clever idea. It worked! Orange shop goods always catch my eye when I am waking around straightening up displays. I snapped this shot on my tour of the glassybaby studio. 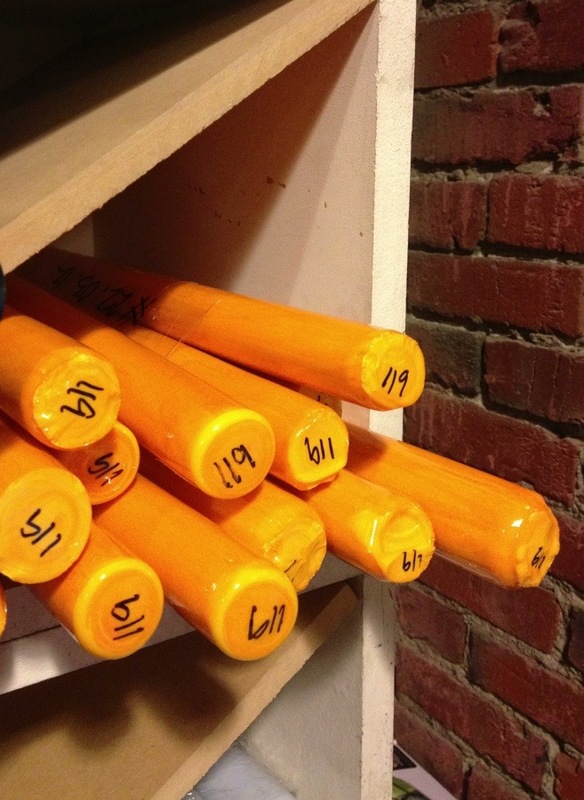 These are the color sticks (not sure I am using the correct term) that are used to create the color for each vessel. 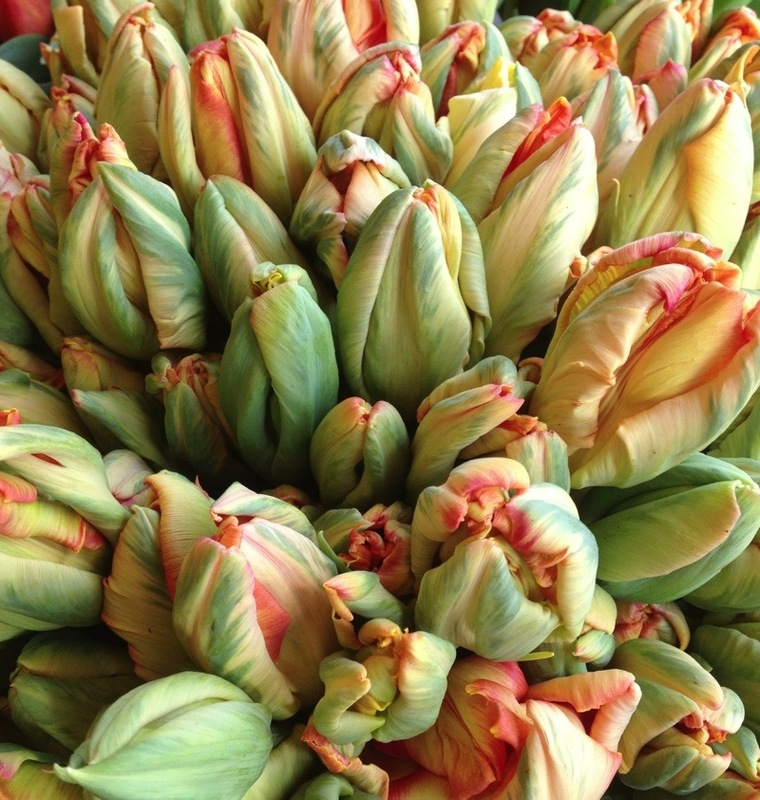 And lastly, these glorious tulips that opened to so beautifully in varying shades of riotous orange. The tulips this year have just been amazing. A happy start of the week to you all! We fly home this evening, so it is our last day here in New York. Breakfast at Buvette in a bit, then meandering around the West Village. Funny how this has become a routine, but this is what we almost always do on our last day in this city that has an incredibly special place in my heart. Thank you for following along these last 11 days. It has been a memorable trip, and so lovely knowing you all are with me in some way. 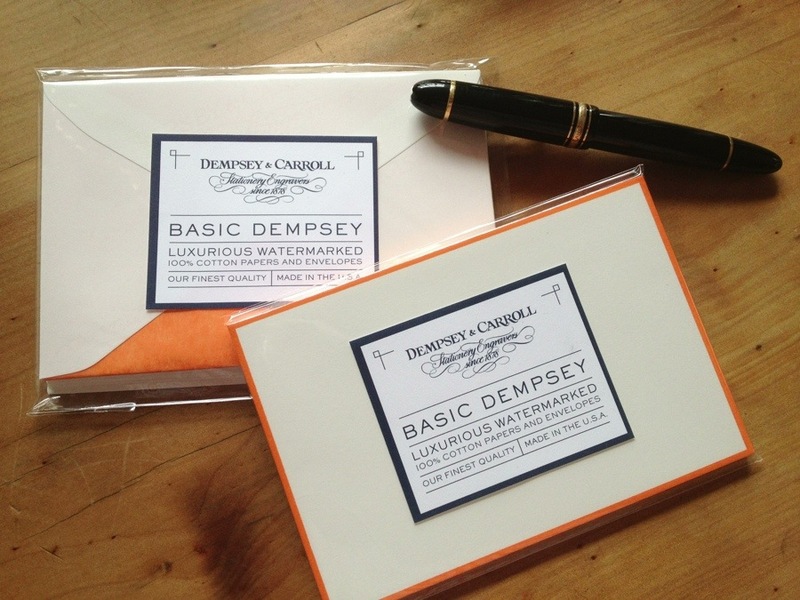 We just received another order of the ‘Basic Dempsey’ from fab stationer Dempsey & Carroll. 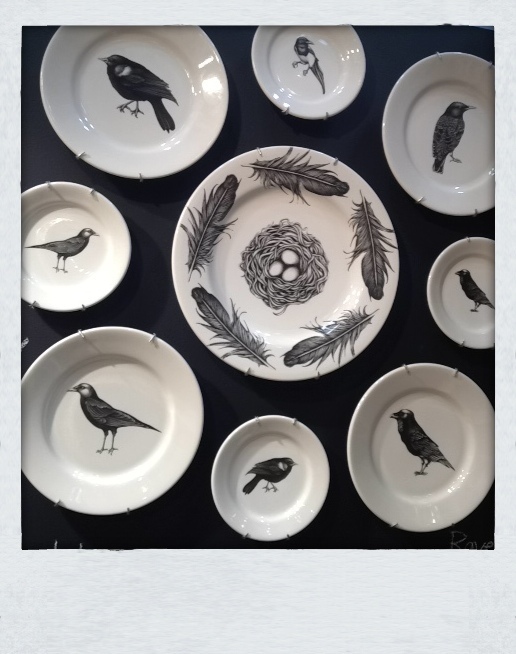 These are really just the perfect little mix & match sets. 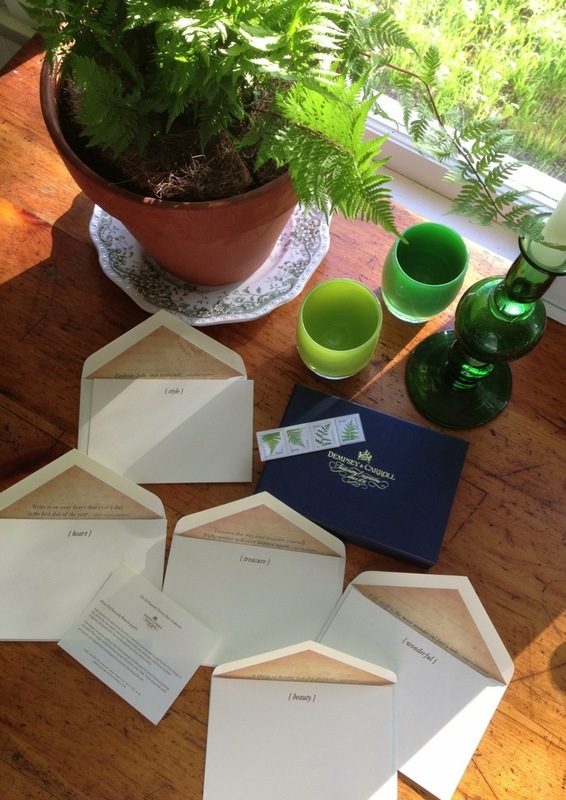 You buy 10 of the individual flat notecards in a set, and you can also buy 10 of the lined envelopes in another set. 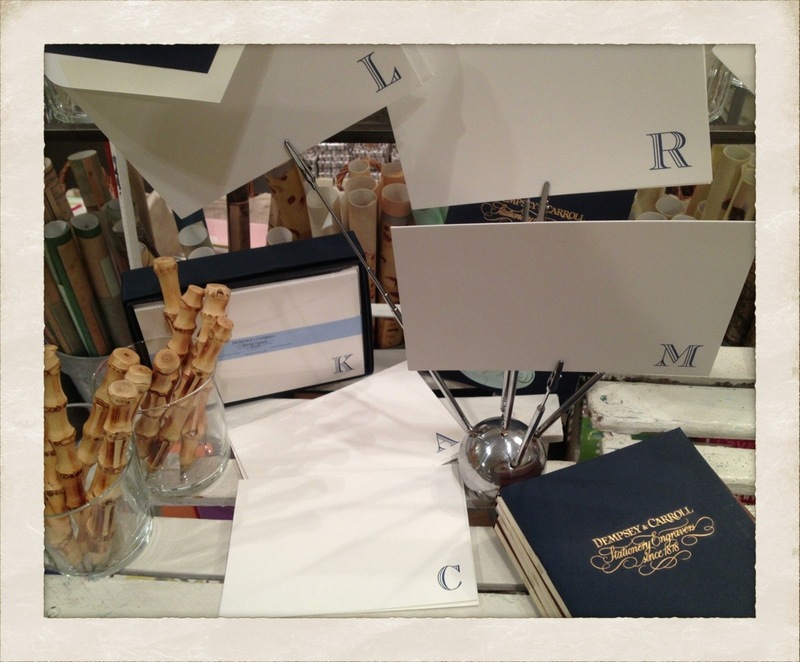 With a lovely range of colors to choose from, mixing & matching is a fun way to personalize your note writing. Or choose the same. 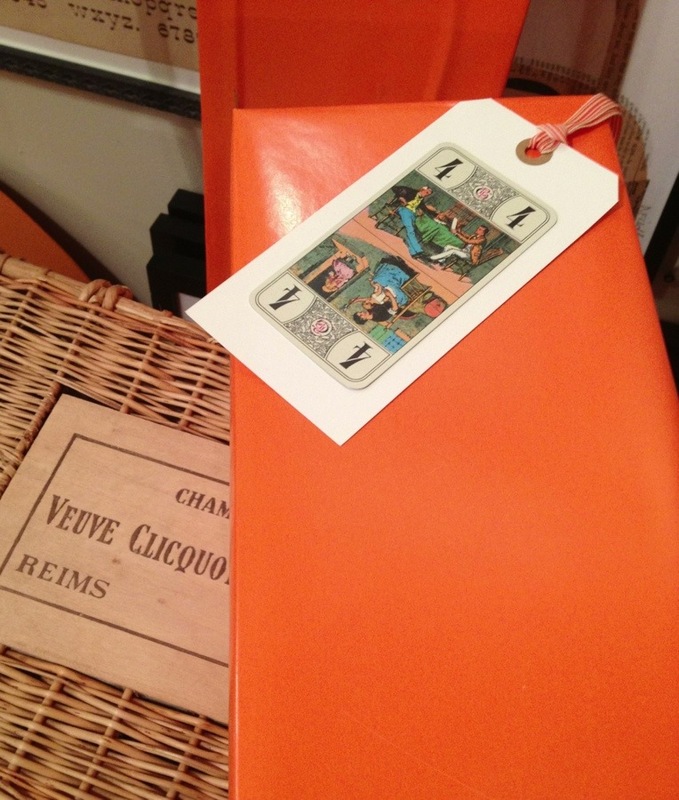 I chose orange with orange lined envelopes (I know, very surprising) for a crisp and clean look, with a little Hermes-y, Veuve-y spin. So nice to have a stack of these at the ready to send off a quick note. We are off to the airport in just a bit to catch a flight to New York. 11 days of action packed goodness. Part upstate, part in the city. It is always fun to have you along for the adventure. Happy start of the week! 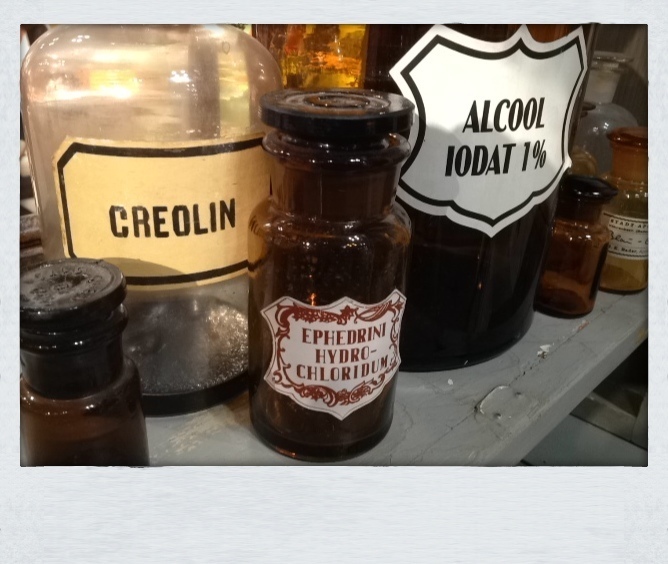 On Saturday when I was enjoying a full day of display, I also snapped a few photos of some things that stood out as goods that would be perfect heading into the new year. After the Holidays, my note writing list is quite long–so many kind gestures and special gifts that need thanking for. 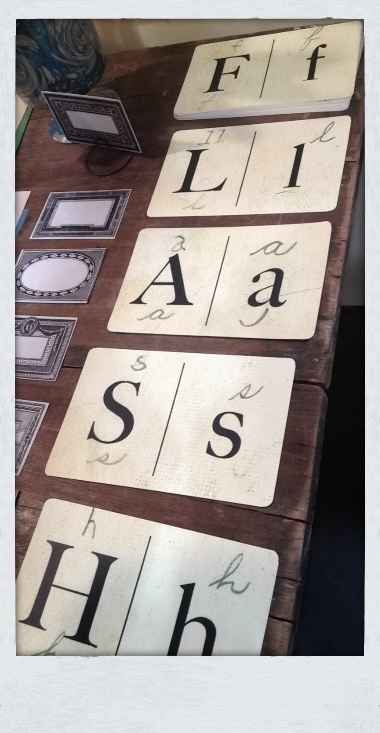 This classic initial set by Dempsey & Carroll fits the bill beautifully. With a bold blue initial engraved from one of their hand cut typestyles on the bottom right corner, it is just the right sized card for jotting a quick note of thanks. With 10 in a box, along with lined envelopes, any left over will work well left out on your desk for visual enjoyment and at the ready for your next note. We can have your initial boxed set sent directly to you if you so desire. Again, another cheers to handwritten notes! It really was such a fun day of buying. I was then whisked away in a waiting car and headed over to a little soirée at my favorite stationer, Dempsey & Carroll on Lexington Avenue. Matchbook had recently featured Dempsey & Carroll, as well as their cool calling cards, so they hosted a little party in their honor. It was a great way to end a very full day. Day 4 begins in just a bit. More tomorrow. Very few things make me happier than receiving a handwritten note. 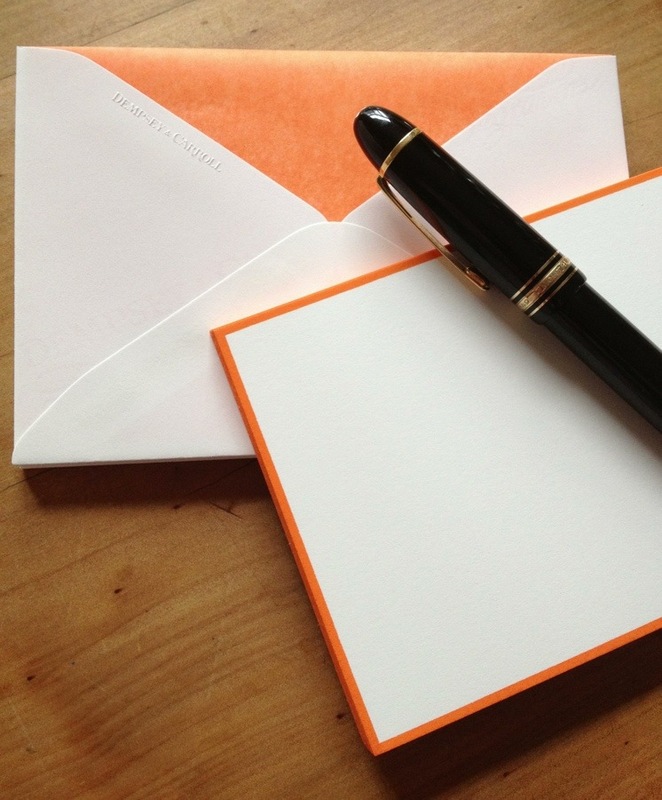 In our world of e-mails and text messages, it has become rarer and rarer that folks send a note. I fall victim myself. I will send a quick e-mail in thanks for a swell dinner and evening we had with friends, then get too busy, and let that take the place of a note. Not good. Not good at all. For I know the joy of getting a note, so to, I know how much it means and the happiness it brings for a friend to open up the mailbox and see something other than junk mail. I send plenty of handwritten notes, but I want to send more. This post is a challenge to myself and to all of us–spread the joy, sit and write a quick note and make someone happy. Here are a few quick tips that make it so much easier. Find a box that pleases you and turn it into a stationery box. Have it accessible so it is easy to reach for when you want to jot a quick note. Fill it with notecards you find on trips or cards that you see when you are out shopping. I find this the quickest, surest way to make note writing easier. 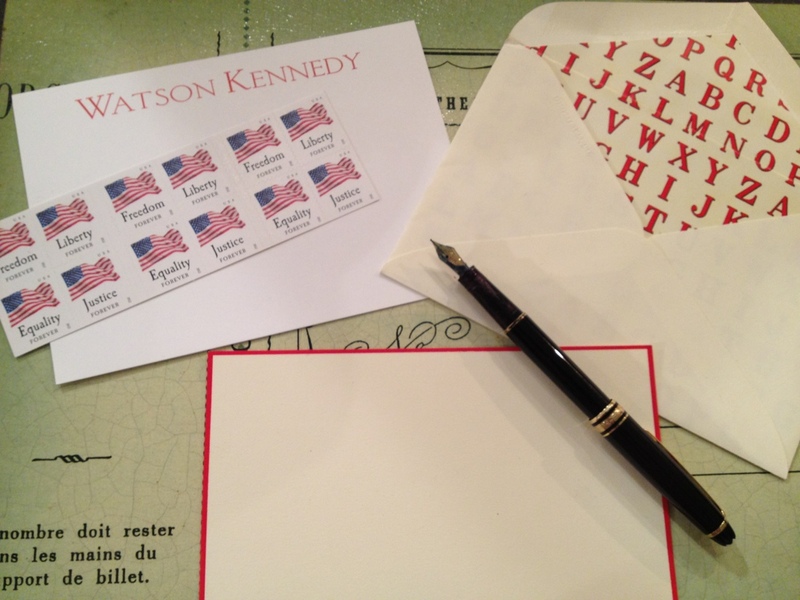 Add your favorite pen to the box as well as stamps. When you are next at the post office, buy a few extra sheets of ‘forever’ stamps with different images on them, so you have them at the ready. If you still use an address book, have that in the box too. That is it! By having everything in one place, it makes writing a quick note so much easier and much more doable. Now the note. I think what stops many folks is they think it needs to be lengthy. It does not. A few well-crafted sentences is all you need. Just make it personal and heartfelt. The mere fact that it is handwritten will make it so very special. Cheers to sending AND receiving many handwritten notes!!! 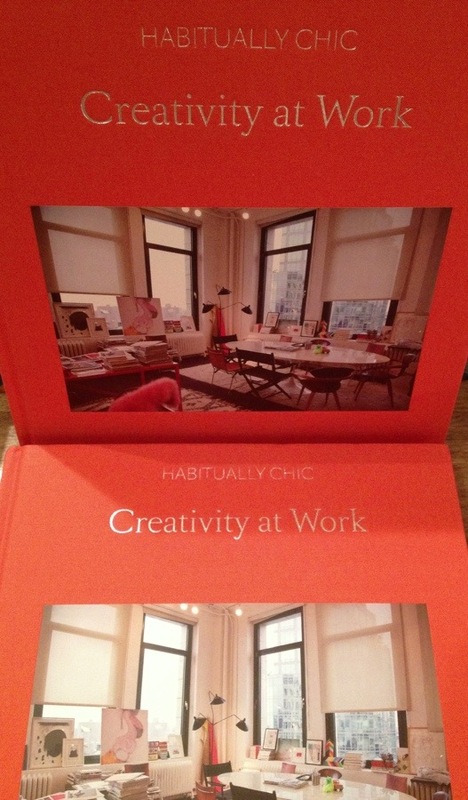 We just received a new batch of cards from one of my very favorite companies, Dempsey & Carroll. 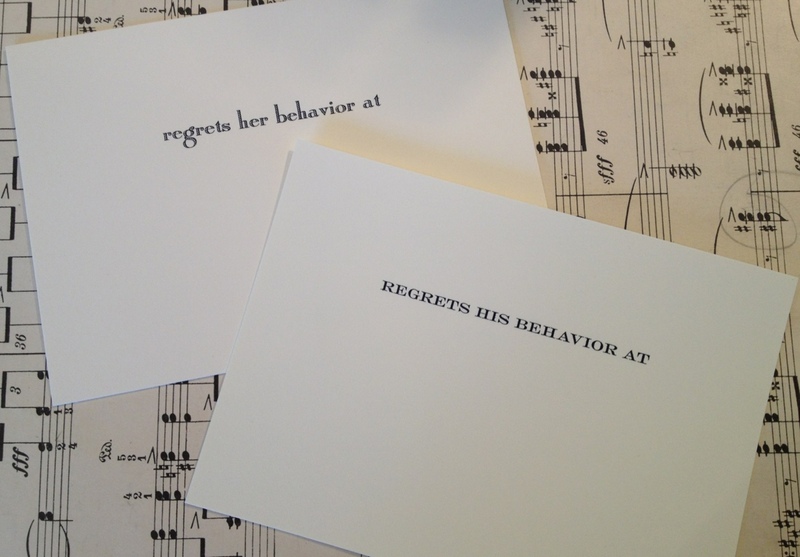 The very witty ‘regrets’ cards are just the thing to send after a raucous evening at the home of a friend for dinner. Given the number of these we have sold already, I think this is something we will stock for quite some time. 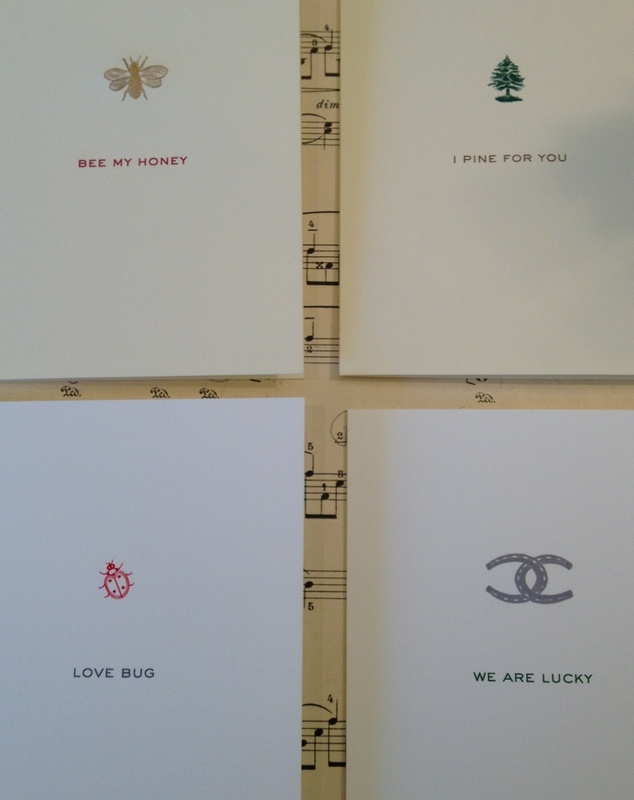 The below 4 cards are just sweet little notes to send throughout the year to a loved one. I think receiving one of these cards, not on Valentine’s day, makes it even more special and romantic. Perfect slipped into a purse or briefcase to be found at an unexpected moment during the day.